While pondering your next home DIY project over a morning cup of coffee, you suddenly realize that it is staring you right in the face. Your kitchen cabinets could use a face-lift! 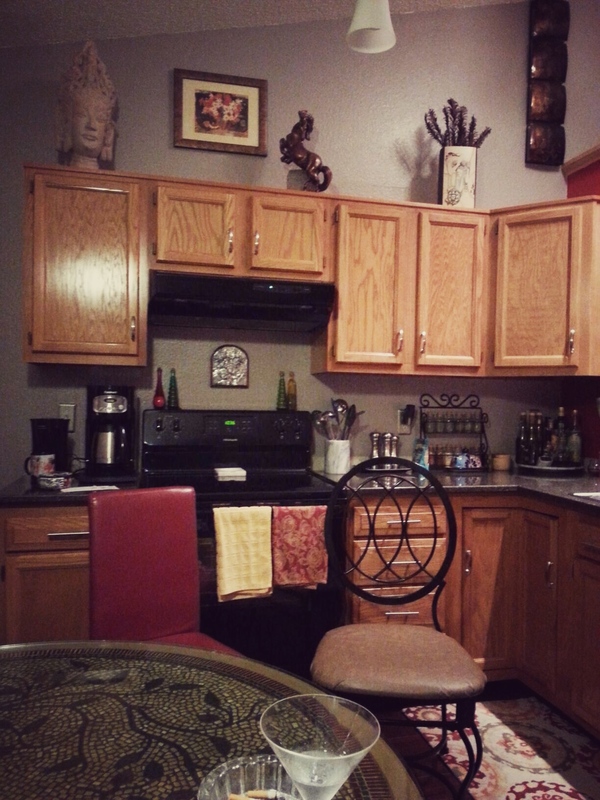 Re-staining wood cabinets is an easy and economical way to perk up the busiest room in the house. 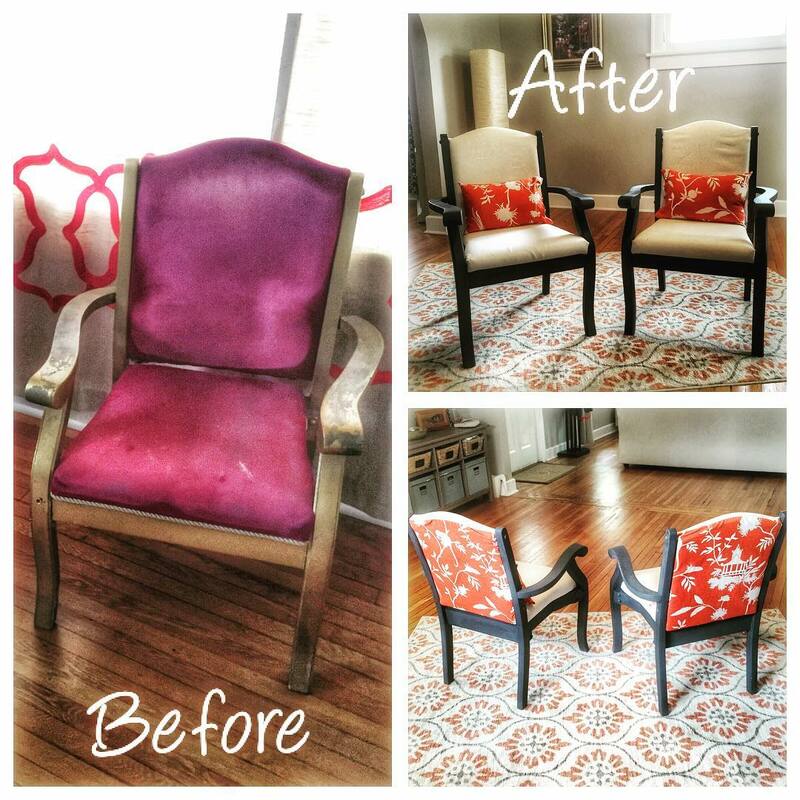 If yours are looking a little lackluster, all you need is some wood stain and a little sweat equity. Do you have fiberboard cabinets? Determine if your cabinets are hardwood or fiberboard. Test an out-of-the-way spot by sanding off the finish or paint. Fiberboard will not stain so you may have to re-paint them. If you have hardwood cabinets, then you’re ready to start. Remove the doors from the cabinets – Clean out all cabinets and drawers. Label the doors and cabinets so that you can re-assemble them in the correct order at the end of project. Unscrew all hardware and hinges – If you are keeping existing hardware, label them to match where they came from. Clean the surfaces – Use mineral spirits to clean dirt and grease from the wood. It may take several passes. Apply gel stripper – Spread the solvent onto your cabinets and allow it to bubble up old finishes or paint. Scrape it off with a putty knife. These chemicals are very corrosive and toxic so wear a mask, gloves and safety googles. Use wood putty to fill holes and gouges – To install new hardware, cover the old holes with wood filler and let dry 24 hours. Sand all surfaces – An orbital sander with 220 grit sandpaper will smooth the wood and remove any old paint or finish. For any trim or hard to reach places, it is best to sand by hand. Wipe with tack cloth to remove dust and debris. Apply stain – Work with the wood grain and apply light, even coats. 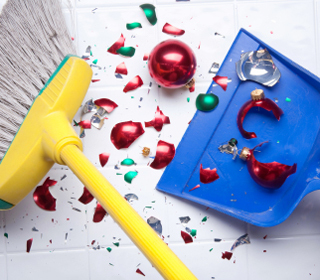 Wipe excess off with a cloth. 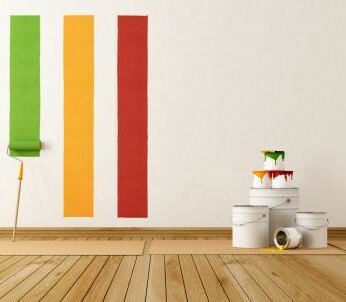 To get a deeper color, apply several coats not thicker ones. Allow wood to dry completely between each pass. Add a polyurethane coating – This will help protect the wood and allow for easier cleaning. A paint sprayer will make it easier to do a large number of cabinets and will help prevent streaks. Re-assemble the cabinets – Match the numbered doors to corresponding cabinets. Install new hardware – Drill new holes to add new knobs, pulls and hinges. Staining the existing wood cabinets is not only a great way to freshen up the look of your kitchen without spending a lot of money, recycling the cabinets is also eco-friendly. Now that you’ve done such a great job on the cabinets maybe it’s time to tackle the backsplash. Looks like you’ve found your next DIY project without even trying. You are on a roll! Whether orbital sanders, drills or paint sprayers, our expert staff is always on hand to help you find the right equipment to handle your home DIY project. If re-staining the cabinets isn’t enough of a change for your kitchen, check out our blog, How to Paint Your Kitchen Cabinets to Perfection for some excellent tips on doing it like a pro. As always, if you have any questions about what to choose, pricing or how-to’s, don’t hesitate to contact us. Stop by our store — we’re open seven days a week. How many times have you looked at the heating bill and almost fell out of your chair from shock? Energy prices are nothing to sneeze at, which is why improving your home’s insulation will go a long way in keeping your family and your wallet comfortable this winter. The power company will conduct an energy audit on your home to detect the areas with the most heat loss. Generally, a home loses half of its heating and cooling through the walls, windows, floors and roof. Determining where to insulate is the first step. You’ll likely find that insulating the attic is one of the simplest and smartest ways to lower your heating bill. Each area of your home requires a different R-value of insulation. The R-Value determines a material’s resistance to heat flow. The higher the number, the better it is at stopping loss. A typical Indiana attic needs insulation with an R-value of R49. Exterior walls require R13-21 and floors between R25-30. Two popular types of insulation are the rolled blanket insulation and the loose cellulose variety that is blown into place. Insulation comes in a variety of materials like fiberglass, cellulose and mineral wool. Fiberglass tends to settle so thicker layers have to be put down. Insect and fire resistant cellulose is the most common. Mineral wool is made from molten slag, which is spun into fiber. It is more expensive but totally fire resistant. Whichever you choose, remove old insulation and make sure to seal any possible air leaks before installing the new material. Apply a thick enough layer that covers floor joists. 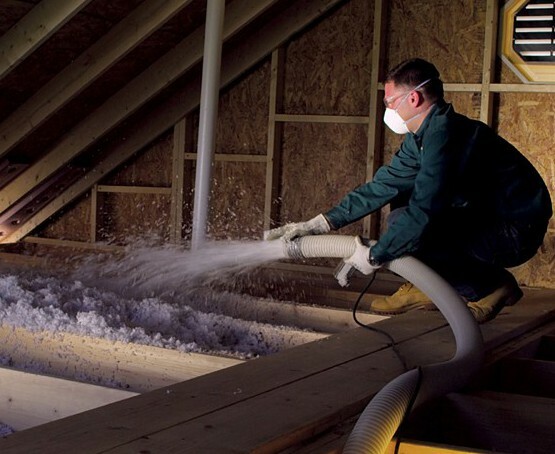 For blown insulation, a sprayer makes easy work of distributing cellulose around beams and other obstructions. If you live in an older home and don’t have double pane windows, you may want to look into installing storm windows. These can be added externally or internally and will help keep cold at bay. Window insulation kits are another option. They contain large sheets of plastic that is taped around windows to eliminate drafts. Foam weather-stripping can help seal around windows and doors, keeping weather out and heat in. Even if you have double pane windows, check the trim around them to make sure it’s sealed tight. Blinds, shades and window treatments such as insulated curtains can also provide an additional buffer against the cold. Check for air leaks around pipes, exhaust fans, ducts and chimneys. You’d be surprised how much heat is lost around the dryer vent. Seal them tight with spray foam. Purchase insulating foam plates for electrical outlets on exterior walls. They install behind the plastic outlet cover and block air flow. Another source of heat loss occurs around the hot water heater, which accounts for 19% of your total home energy bill. Today’s models are well-insulated; however, if you place your hand on the side and it feels warm, then there’s heat loss. For $30, wrap the hot water heater with a blanket and save 10% on your yearly power usage. Wrap all hot water pipes within three feet of the water heater. Polyethylene and neoprene wraps help keep the water hot longer and you can turn down the temperature setting. Be sure to keep the insulation at least six inches away from a gas hot water heater’s flue. This winter, don’t let your home’s warmth go out the window. Whether you roll it out or blow it in, you can never have enough insulation! Wrap your humble abode in a nice thick layer of warmth and you’ll never have to fear those energy bills again. From insulation vacuums and blowers to caulk cutting saws and electric heaters, our expert staff is always on hand to help you find the right equipment for your DIY home improvement projects. To learn how to install attic insulation, read How to Efficiently and Easily Insulate Your Attic. Another post, 4 Cold Weather Basics – Insulating Your Home, offers additional info on improving your home’s energy efficiency. As always, if you have any questions about what to choose, pricing or how-to’s, don’t hesitate to contact us. Stop by our store — we’re open seven days a week.